Review: These versatile blending pens give a huge range of tones for easy shading. A brilliant way to add extra depth to your pen illustrations, with everything you need in one handy package. 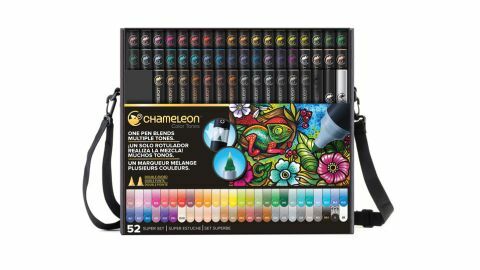 The Chameleon Colour Tones Super Set is a bundle of 52 double-ended pens with a difference: a mixing chamber that enables you to create multiple tones. Just pop the mixing chamber on the top of the pen that you're using and turn it upright to make the reservoir of toning medium run down into the bullet or brush-type nib. The longer you leave it, the lighter the tone. Then when you use the pen, the toning medium slowly runs out until you return to the original, darker colour. If you need to go in lighter afterwards, you can use the clear blender pen. It's ingeniously simple really. The set has every colour you'd need, plus a clear blender pen, detail pen, tweezers, spare nibs and instruction booklet in a handy case. All the pen elements are refillable too. Plus, in use, the clever mixing technology turns the 52-colour set into at least a 150-colour set! This article originally appeared in Paint & Draw issue 3; buy it here!